Today's Guardian has an article about job interviewer's trick questions and riddles to winnow applicants. Try this one. You're locked in a pitch-black, empty room with bare walls and no electric lights. You've got a book of matches, a box of tacks and a candle. How would you attach the candle to the wall for a light? The best answer: empty the box of tacks. Take the box top, turn it upside down and tack it to the wall. The box top projects out like a little drawer. Then put a tack to attach the candle to the box's bottom. The tack's point, projecting through the box bottom, serves as a pricket. Finally, slide the box bottom into the box top on the wall. The nested top and bottom will be sturdier than either alone, and safely support the weight of the candle. In my observation, tack makers stopped using that style decades ago. The boxes cost too much and slowed processing which diminished productivity. These were disparaged when the blister pack appeared. 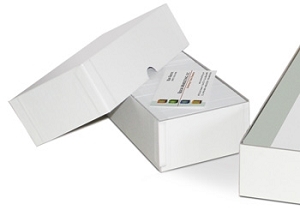 These permitted small quantity packaging in an easily handled form. Everybody appeared to win. The customer is sold on the convenience; she can see the product, and buy as few as she needs. There is little excess to store.The blister pack's total retail cost is less than the box price. The seller has an attractive low maintenance display which saves his clerks' time because customers find the options they desire on their own. The cards the blisters were on, make the product bulky enough to discourage shoplifting while they provide a good platform for price tags and, later, bar codes. The maker can inflate the price per unit outrageously. The per pound price of a 100 count box might be $10 at retail. When repackaged in tens, those same fastenings might sell for $1.98 each. That makes $19.98 per hundred. The maker and seller more than double their margins. The customer "saves" $8.00. Neither blister packs nor reverse tuck boxes would be suitable to support the candle as the full telescopic box does. Given the difficulty I had finding the image of the telescopic box, I guess it would not be very familiar to today's job applicants. The interviewer might think that these children just don't know as much as she did at their age. That would prove that the labor force has declined in quality? Perhaps that is the real point?